Over the past couple of years, several readers, who had problems after updating to a new Windows 10 version. tried to use System Restore to roll back their computer to the previous version of Windows only to find out, the hard way, that System Restore does not work for this, and can sometimes can cause serious Windows problems. 1. Your computer is running well and then you install a program and it messes up your system. 2. You make some changes on your computer and things start going awry. 3. You edit the registry and you change something you shouldn’t have. 4. You downloaded hijacker bundled in some other software and can’t get rid of it. Running System Restore as soon as you start having problems after doing things like these is the easiest way to undo whatever you changed or installed that caused you major problems. But System Restore should not be used to roll back Windows 10 Version updates like the April 2018 Update (version 1803). 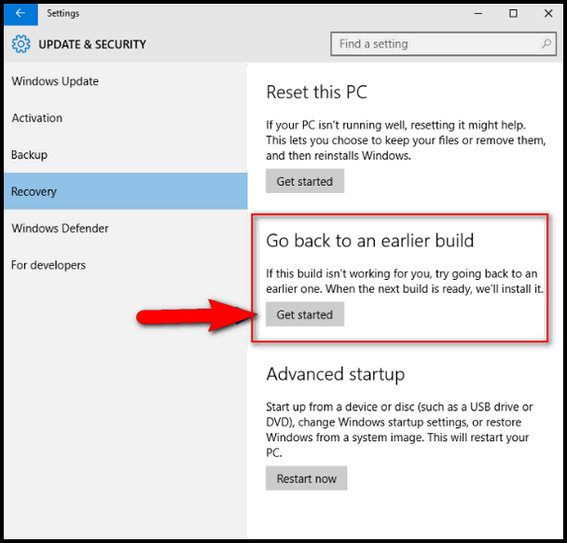 If you have major problems after updating to a newer version of Windows – for example Windows 10 April 2018 Update – use the following method to roll back the update and return to the previous version of Windows. If you roll back this way you will not lose any programs or data as long as you this within 10 days of installing the Windows 10 April 2018 Update. After 10 days, this option will no longer be available. Here’s the proper way to go back to he previous version of Windows if Windows 10 April 2018 Update causes you major problems. a.) The update was not a version update. c:) You see the option but it’s not clickable or doesn’t work – you have waited too long. So, now you know what to do if the new Windows 10 April 2018 Update (version 1803) causes you major problems. Restoring from a restore point after a new version of Windows is installed is a moot point, since the new version deletes all restore points from the previous version. Not moot if the Update does not complete successfully and restores the old version but not correctly. Trying to run System restore resulted in not being able to boot the computer – in both cases. We have had this happen to 2 people. Also, the article points to the correct way to go back to the previous version of Windows. “If the version does not complete successfully.” You didn’t mention that in your article. Yes of course ,then, you could use your restore points. Seems I have read some of your responses and when you err you inject other variables into your response to justify your answer. Need to accept we are all fallible. If you have a point, feel free to make it. We make mistakes like everyone else and we’ve had a quite a few corrections & retractions over the years. You’re assuming we think we’re infallible and that’s just not true -as anyone who has been with us for any length of time knows.